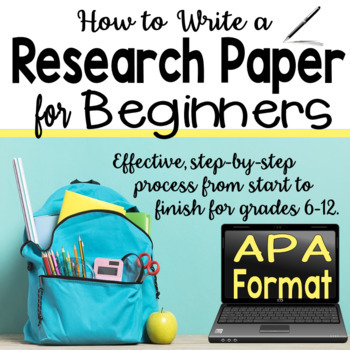 Research Paper for Beginners - APA format - Complete unit from start to finish! The research paper is my least favorite unit to teach. It is cumbersome, multifaceted, and exhausting because students have such a difficult time grasping the concepts at first. 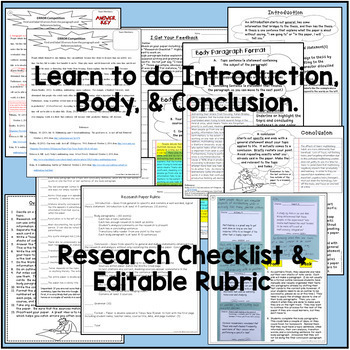 Therefore, I constructed this unit for those of us who need an easier, more comprehensive way to teach the research paper without pulling our hair out. This unit teaches the basics of writing a research paper for beginners. In this unit students learn how to . . .
✏ Quoting, Paraphrasing, and Summarizing . . . Oh My! 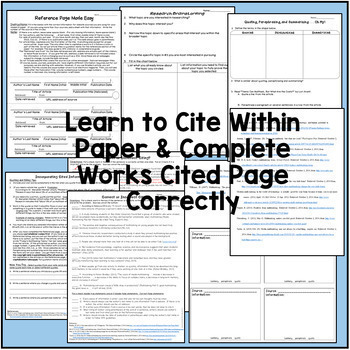 ► This unit does not teach how to do long quotations or how to cite multiple works by the same author because those topics do not come up in this beginner’s research paper. A student outline is not used in this unit because the beginning paper is short, and this process makes it so easy that an outline is not needed. Of course, you may add those details if you wish. A note about feedback assessment included here: This is for students to prove they have read and understood your feedback on the paper. Oftentimes, students do not read feedback if they are happy with their grade (I have had plenty of students tell me that), but teachers spend a lot of time writing comments and correcting errors. Thus, the final activity in the packet holds students accountable for reading and understanding your feedback. 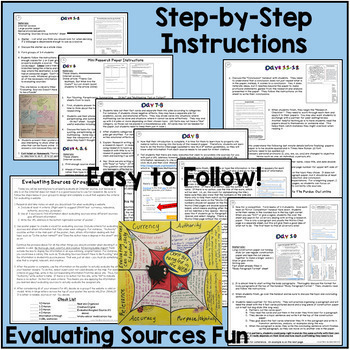 This research unit provides day-by-day lesson plans. The pages are packed full! It will take approximately 2 and ½ weeks of 90 minute block classes. It may take more or less time depending on your school’s schedule and level of students in your classes. There are a variety of activities included in this unit such as individual and group work, a competition, scaffolding exercises, etc. Enjoy this unit, which makes research MUCH SIMPLER for students and teachers!!! • Persuasive Essay or Speech - Current, Real-World Prompt!